Whether you want to power your house in the event of an emergency outage or bring extra power along for your upcoming RV trip, it’s essential to pick the best inverter generator to check all the key items off your wish list. It doesn’t matter if you’re just now considering purchasing an inverter generator or you’ve been scouring the internet for ages but haven’t landed on the right one, you’ve come to the right place. Keep reading for the top inverter generators on the market currently, plus a detailed buyer’s guide to make the purchase process just that much easier. Best Inverter Generator Reviews Of 2019 – Which One Is Right For You? Top of our list of best inverter generator is a low noise product by WEN. The WEN 56200i Super Quiet inverter generator is one of the quietest on the market currently, making it a fantastic choice if you do a lot of camping or RV trips. With clean 2000 surge wattage and 1600 rated wattage, you’ll get a lot of use out of this generator and keep all your devices powered up too. If you go camping often and need an inverter generator that won’t wake anyone with its loud engine, the WEN 56200i Super Quiet generator emits only 51 dBAs when you run it at 25% output. Even if you run the inverter generator at 75%, you’ll still only hear about 55 decibels of sound. The US Department of Health and Human services have declared that the silence of this generator is on par with the level of noise from a normal conversation. In short, you won’t be waking up any fellow campers with this device. We love that the WEN 56200i is both CARB and EPA III compliant, and it emits energy that is friendly to the environment. You can run the generator for 4 hours at 100% output and 6 hours at 50%. We feel that the output rate is lower than some other products on the market, but if you don’t need to charge for longer periods you’ll be just fine. The 3100-Watt RV Ready Generator by Champion is silent and light to carry, with an impressive dBA of only 58. It offers you as many as 8 hours of running time if you operate at a 25% output, making it an excellent choice for on-the-go power. If you need backup power on the go, the 3100-Watt RV inverter generator by Champion is an excellent candidate for your shortlist. With its user-friendly touch panel, you can monitor your generator’s operation in one location. The low oil shut-off sensor prevents your generator from becoming overheated or overcharged. We noticed that the engine has a smaller oil capacity than some other products, but this is to be expected with its slightly reduced engine size. Even so, you’ll still enjoy as many as 8 hours of total run time if you keep your generator on a quarter output. Again, if you need a quiet generator for activities like tailgating and RV trips, the 58 dBA noise levels of this device are ideal. You can also use this inverted generator to keep your larger tools and devices powered up all day long as well. The generator does not have an electric or remote start as some devices do, so you’ll have to contend with the standard recoil cord kind. We really like that this generator only uses clean power with under 3% THD and Economy Mode to increase the longevity of your engine. The Briggs & Stratton 30675 Q6500 Generator sports an impressive 6500 watts of starting power and 5000 watts of ongoing power to keep all your devices running. With a large 5-gallon gas tank, you’ll enjoy as much as 14 hours of run time when you keep the generator running at 25% output. Keep reading for the key specs and our review. The Q6500 Generator is a great option if you need to charge large devices for longer periods. With a 6,500-watt starting power and 5,000 watts of ongoing power, you’ll have much longer periods in between charging. The 306cc engine is powerful enough to power up large tools and appliances. We especially like the impressive 5-gallon tank size, that ensures your fuel lasts all day long. The generator also features a user-friendly gauge and power meter so you can monitor usage as you need to. While we wish the decibel rating was a bit lower for this device, it is still pretty quiet due to its steel frame that helps muffle all engine noise. You can use this generator for everything from highly sensitive electronics to large appliances in the event of a power outage. If you’re looking for a compact inverter generator that you can easily transport with you, the Generac 7117 is an excellent option. It is incredibly easy to use with a built-in handle and economy mode to help you save on fuel. Plus, it provides 2200 watts of starting power and 1700 watts of running power. The Generac 7117 can keep your devices running all day and into the night with 1700 watts of running capacity and an initial surge of 2200 watts. The generator is compact, making it easy to transport from during work or when camping. You can also use it to power up your appliances and sensitive mobile devices in the case of an unexpected power outage. 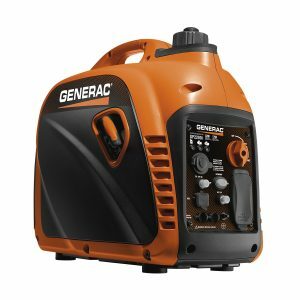 We found the 1.2-gallon tank to be pretty small when compared with other generators, but you’ll still enjoy 7 hours of running time at as much as 50% capacity. 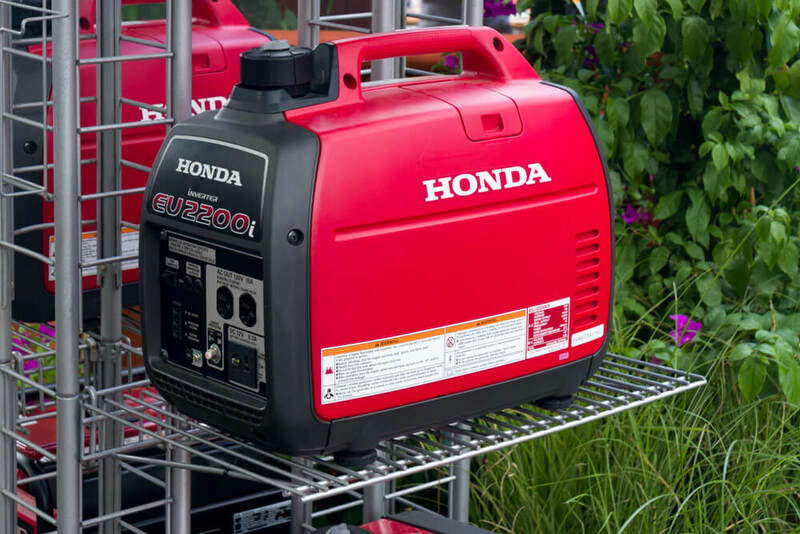 If you use the generator every day, you can easily get anywhere from 10 to 12 hours out of a single gas tank. The eco-mode will help you reduce your fuel consumption and muffle the noise levels too. The next best inverter generator on our list is very compact and lightweight, while offering an impressive 10.5 hours of running time at a quarter output. Noise levels vary, but even at 100% output they don’t go beyond 61 dBA. Check out the key specs and our review below. If you’re looking for a very lightweight, compact, and quiet inverter generator, the Yamaha EF2000iSv2 could be the one for you. It runs at 1,600 watts, with a 2,000 watt start time. It also features an air-cooled, 4-stroke engine that keep the device from overheating. You can run the generator for up to 10.5 hours at 25% output on a single tank of gas. We like the Smart Throttle element that adjusts the machine’s engine speed based on its load, which translates to a more fuel-efficient run time and less noise. With its muffler, the machine has a decibel level of only 51.5 when running at a quarter load, so you’ll barely hear a thing. Another aspect we like about the Yamaha EF2000iSv2 is its stable power that works well with very sensitive devices such as mobile phones or computers. However, we don’t feel that it is ideal for larger appliances that require heavy amounts of power. The generator by Ford is also lightweight and compact, weighing only 46.3 pounds. It has a mid-range dBA noise level of 59 and is perfectly safe to charge all your sensitive electronics in the event of an outage. The Ford FG2200iS’s starting power of 2,200 watts is enough to power a room air conditioner or medium sized refrigerator. It would also be sufficient to power a computer, mobile device, TV, or microwave. So, you can definitely keep multiple devices charged at once. We would say that this inverter generator is probably not going to be enough to keep very large appliances that drain lots of power going for long periods though. The gallon tank capacity for the Ford FG2200iS is small, but you will still enjoy as much as 6 hours of run time at a 50% power output. If you’re tailgating or camping, you probably wouldn’t need to use anywhere near that much power output at one time, so the generator could last you in those scenarios anywhere from 12 hours and beyond. You can also keep tools at a construction site powered up as well. Of course, larger tools will drain your battery much faster. The Ford FB2200iS definitely has some major features going for it. For one thing, it is very easy to use and maintain. It starts like a breeze, but also features a handy control panel. The multiple outlets make for flexible charging, plus the LED indicator will help ensure you keep track of fuel levels and avoid generator overload. While the Pulsar Portable Gas-Powered Generator offers a mere 1.18-gallon capacity, you can enjoy a run time of up to 8 hours at 50% output. Plus, the 59 dBA noise levels are quiet enough that you won’t disturb anyone when tailgating or camping in the great outdoors. The Pulsar 2,000-Watt Generator offers a satisfactory 2,000 watts of startup power and 1,600 watts of continuous energy. The 1.18-gallon capacity is definitely smaller than other options , but it still provides as much as 8 hours of continuous operation with a 50% load. For things like camping and tailgating, you probably won’t even need to use a 50% output, and so you can enjoy a much longer power supply. The generator features a handy suitcase design and weighs just 47 pounds, so just about anyone can lift and transport the machine with total ease. The 59-dBA noise level is a bit higher than we would like, but still quiet enough that it won’t cause annoyance. The Pulsar generator is perfect to charge your sensitive devices such as laptops and cellphones, with multiple outlets so you have flexible charging options. You could also charge smaller household appliances with the Pulsar generator, but larger equipment will probably drain the generator pretty quickly. It also has a recoil start, so if you don’t mind not having an electric or remote switch, you’re good to go. Our last pick is a powerhouse despite its compact size, with 3,100 watts of surge power and 2,800 watts of continuous running power. At a three-quarter output, you’ll still only hear a 63 dBA noise level. The generator itself can run as long as 7.5 hours at a 50% load, so you can charge a range of devices all day long. The mighty WEN 56310i has an excellent 3.5 horsepower with a 4-stroke OHV engine featuring air-cooling capabilities to prevent the machine from overheating. The inverter generator has a larger 1.85-gallon capacity when compared to some of the other devices on the market, giving you nearly 8 hours of power at 50% output. When operating at a quarter load, you’ll enjoy a 57-dBA noise level that is as quiet as a human conversation. The unit is not only perfect to power up your sensitive electronics, but the 3,100-watt surge power and 2,800 watt running power are sufficient to fuel everything from your home’s electric furnace to a rooftop AC. With two 5V USB outlets at the front, a NEMA twist lock outlet a 12V DC outlet, and two 120V AC outlets, you can keep a wide range of appliances charging at the same time. One area we feel could be improved is the charge life. That said, if you’re powering smaller appliances or running at a lower output, you’ll extend your running time considerably. Check out the top pre-purchase considerations and inverter generator elements you need to know before making your purchase. You won’t want to miss these! 1. Determine what your generator needs are. 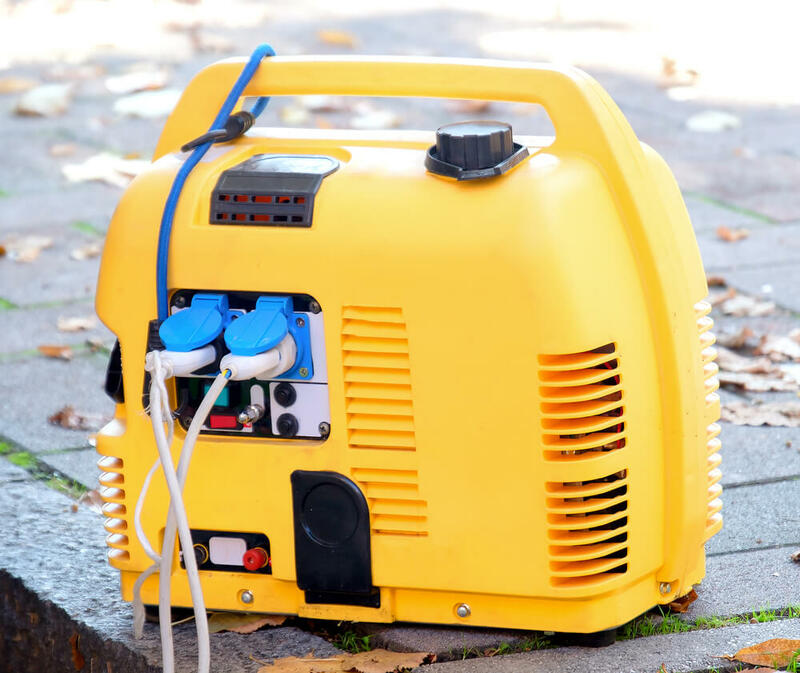 Will you be bringing the generator on the road with you for trips, or do you need a backup generator in case of an outage? Once you identify your generator wish list, you can determine the power wattage you’ll require. 2. Decide whether you want a compact generator or a small generator. What’s the difference? Well a compact generator usually offers 800 to 1,000 watts of power, which is enough to power one or two devices, but not much more. A small generator, on the other hand, usually sports between 1,600 and 2,000 watts of power and lets you power more than just a couple appliances at once. If you want to keep an appliance like an RV air conditioner running, you’ll need a medium inverter generator with slightly higher wattage than a small generator. So, what’s the difference between inverter and conventional generators? Conventional generators are powered by fuel like gasoline, diesel, or propane. A conventional generator features a motor connected to an alternator that generates electricity. The thing is, a conventional generator requires an ongoing speed of around 3,000 rpm to generate a constant current, otherwise the power will falter. On the other hand, inverter generators run on DC power, such as a car battery or solar panel. The generator converts DC power to AC with electronic circuits. You have much greater flexibility with an inverter generator, because once converted, the electricity can transmit in various frequencies and voltages. You should not use a generator indoors. The exhaust a generator emits releases carbon monoxide fumes that are dangerous and deadly. To avoid risk of shock or damaging your device, you should protect your inverter generator from the elements like rain. If you’re outside, use a tent or tarp to cover your generator and keep it from getting wet. Inverter generators are enclosed in order to muffle the engine noise, so most machines don’t have a dBA above 60. If you want a quiet engine that won’t cause distraction, an inverter generator is a fantastic choice. If you want to use your inverter generator for backup power to keep multiple appliances running in case of a power outage, units like the Honda EU2200i, WEN 56200i, or Ford FG2200iS are excellent picks. You’ll be able to keep multiple devices running at once for hours at a time. If you’re more interested in using your generator occasionally for things like outdoor events, tailgating, and camping, you might prefer the Yamaha EF2000iSv2 or Pulsar Portable Gas-Powered Generator. Whichever you select, you can be sure of the durability, energy efficiency, and low-noise power of each product listed. An inverter generator is a quality investment to keep all your essential devices powered for hours, whether you’re on the open road or at home.